This is the first blog of the rest of my lif….er…I mean this is the first blog written from my new house, Casa Turchese. The view from my balcony looking out into the bay and a small cup of espresso in my hand means that, after months of moving around, I finally have a place to call home. The last week have been particularly mad; shopping for a house and getting everything set up is no fun. So I won’t bore you with the details. BUT here are a few things to note. First off, setting up a house is not as easy as it sounds in Honiara. There is no Briscoes, no Target, no one stop shopping place that has everything you need. The Honiara shopping scene is made up of dozens of tiny little shops; each carrying different supplies and items. We had to go to literally about 20 shops to sort of outfit the house, even after the landlord supplied many kitchen items for us. It’s not, what anyone would define, as a relaxing experience. People don’t shop here for fun or for leisure; it’s basic and rough. The prices and quality vary from shop to shop. The shops are dusty and there are rarely any sale signs out-front. Finding things like fitted sheets are impossible. It’s a bit of nightmare trying to get everything sorted and as I sit here, enjoying the view, I’m still exhausted from three days of nonstop running around. Store names are great too…there is K-K Mart, Barak’s, Rainbows and Pomas. We tried to get our keys for the house cut and the lady at the hardware store (Placemakers) told us to go to what sounded like “Legal Queen”. When we found the store, it was Kwee Kwok Keen...you might have guessed that all the shops are run by local Chinese families. On Friday, we go to about 14 stores…Saturday is a bit of a problem because stores are only usually open for half the day. Christmas has depleted the stocks of many items and new items won’t be coming in until February. The combination of small stores, lack of supply, lack of variety and just plain hot, dustiness of it all does NOT make for a pleasant experience. To top off the running around, I have stupidly organized a housewarming party on Sunday afternoon….I thought it would be pretty straight forward getting the house sorted. I was wrong. Once again, my optimistic nature undermines me. To be honest, the adventure really started last Wednesday, when another volunteer and his son and his son’s friend arrived in Honiara from Kia, off the boat. Now, there are really only two ways to get around here in the Sols; boat and plane. Flying is EXPENSIVE, but it is the preferred method of most people. My friend, Steve, almost spent 800 New Zealand flying from Choiseul to Honiara (from one end of the province to the other). James*, the guy from Kia, on the other hand, took the boat out, which took about 16 hours and had to sleep on the top of the ship deck, under a series of small, blue tarpaulins. It cost him about 300 Solomon Dollars (around 40 N.Z. bucks) to come out on the boat but it sure was an uncomfortable ride. Also, the boats are unpredictable; he came a day early because the boat didn’t stop at all the villages, like he initially thought. Anyway, I pick up James and the two youngish Kiwi blokes from the wharf, a bit unprepared for their arrival but hopeful it would turn out alright. Suddenly, I was surrounded by men everywhere, with Steve still around, we have five people staying at the house for one night. We watched a movie, ate dinner and talked until late. James is an older gentlemen and he is a tough kiwi bloke, for whom everything is possible with some number 8 wire. James is an introspective sort of fellow, like most kiwi blokes and literally, he is a man who lives on his own island. By himself, with only solar panels and mosquitoes to keep him company for months on end. He has his own boat to ferry himself over to Kia, the local village. There are no stores or local markets in Kia. He has to fish every day to eat. The man is completely amazing. While living alone on a tropical island might turn some people a bit funny, James takes it all in stride, with good humour. He finds Tessa and my antics hilarious, as he helps us get the shopping done. Now, shopping is not James's bag but he puts up with the dusty shops, the quarreling between me and Tessa pretty well. Anyway, on top of the fun with James and his boys, our charge (Steve and I have been house sitting), the high energy puppy called Shiva, goes into heat for the first time while the owners are away. We first realized this when we saw little blood splatters on the floor everywhere. “Er, Sara…is everything okay with you?” Steve asks, looking completely mortified. My dear friend Steve, who wasn’t raised around dogs, hadn’t realized the whole “going into heat” process”. To be fair, the tiled floor in the house starts looking like a murder scene and we spend time dodging blood droplets and running around with a paper towel to clean up after the dog. The male dogs in the neighborhood circle the house like sharks. At night the Honiara Male Dog Choir bleats beautifully, serenading dear Shiva. Sleep doesn’t come until late. On top of the howling dogs, I struggle with sleeping due to my weird nightmares. Or, more specifically, I fall asleep, in that place between waking and sleeping and I sense a gigantic spider in the room (well not like the Hobbit gigantic spider, but Huntsmen size, anyway). I wake up, like that jerking reflex you get when you are in between the space of sleeping and waking. I then go back to sleep, seeing no spider. Then the spider has perched itself above my bed; watching and waiting to jump. I wake up again, this time, deeply afraid.I go to sleep again. The last one, of course, was the spider perched on my pillow. I wake up this time, screaming. At no time does the spider attack me; it simply watches. I’m terrified though the whole time. I turn the lights on when I sleep now. Scary stuff! At first, I consider the obvious. Maybe it’s late onset schizophrenia. Maybe there are simply giant spiders in my room. Maybe it’s the Doxycycline I’m on, an antibiotic used as prophylaxis against malaria. Tina (my local counterpart), god bless her little cotton socks, says that in PNG, some people take on animal totems and that, if she was still there, she would suggest that someone from a spider clan is attacking me. I ask her what the locals would say, wanting to keep my name out of it. When I get back to work on Tuesday, she looks at me quite concerned. "I talked to some people and they asked me if someone from Western Province owns the house. Because if they do, they think it might be the guardian of the house. The guardian doesn't recognise you and wants you out. You need to leave immediately." She says, very serious. Whatever it is, the next night, after an truly fun game of Texas Holdem with eight other players, whisky and me losing all my money in about an hour, I sleep like a baby. To top off all the excitement, I’ve been charged with looking after several friends of friends visiting Honiara...the house becomes filled with people coming and going to and from the airport in transit. Life buzzes around me and I struggle to keep up with the constant movement, a dog in heat and change of plans and socializing. I get slightly grumpy. As Steve and I leave the house sit, the guards make us a full barbecue of blue fin tuna, sweet potato, melons, and assorted yummies. The guards have been so lovely to us; we have really enjoyed this house sit. To top it all off, there is the mysterious case of Charlie’s shoes…. One of the best (and worst) things about Honiara is the constant ebb and flow of people. Charlie was one of the first people I met here in Honiara and is now heading off to greener, more developed pastures. I’m sad to see him go; he is a decent fellow. On Saturday night, he hosts his farewell party. Charlie is a piano player, like myself, and I spend much of the party being anti-social, enjoying the feel of piano keys under my fingers. Charlie has a nice Roland; I’m envious because my piano doesn’t come until Feb/March. I miss playing dearly; I’m not the best at it but playing relaxes me. I have started playing the guitar a bit more and I enjoy it but nothing can replace the pure joy of playing piano. Anyway, the party ends abruptly with poor Charlie getting threatened with a punch in the head by a neighbor (another ex pat) because the music is too loud. Here I thought Christchurch had the monopoly on bogans…We evacuate the house like a prison break, running for taxis. With some valiant assistance from Tessa, Steve and other people, the housewarming party hums along, with about 25 people attending. I’m sort of shocked and pretty grateful with how many friends and associates I’ve made in the last two months; I think my leaving party in Christchurch had about the same amount of people and I had lived there for four years. Anyway, at the end of the party Charlie comes up to me and blurts out that someone has taken his shoes. We search for his shoes; there was an older, similar looking pair of shoes left behind. 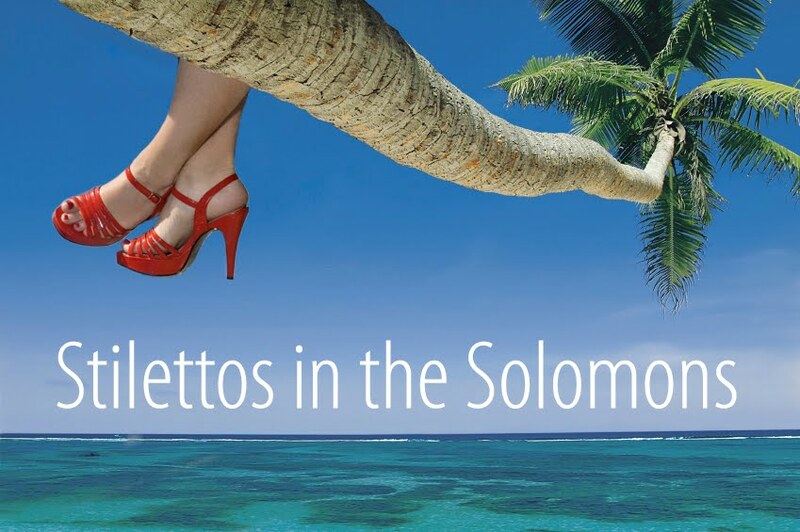 This is one of the problems with parties in the Solomons; no one wears shoes inside and so you leave your shoes exposed to potential switcheroos. Despite the madness, Tessa (remember Tessa? She is my new housemate. Marco doesn’t come back until sometime next week, no one knows for sure…) and I have gotten on pretty well during the shopping excursions and parties. Even after spending all week together, we still stay up until 2 a.m. talking. The next day is filled again with shopping errands and a dip in James's pool (he is house sitting too). Steve, James, Tessa and myself play a classic game of Marco Polo. Now, for those of you who aren't familiar with Marco Polo, it goes something like this: one person is in the centre of the pool, and has to have their eyes shut. The others arrange themselves around the pool. The centre person or Marco (no, not that Marco), disorients themselves and then calls out "Marco!". The others answer "Polo!". The Marco has to then figure out where the people are in the pool and lunge at them, tagging them it. Now, this is a game I played in my childhood. The average age of all of us in the pool is about 33. We squeal with delight at the game, splashing and swimming quickly away. My top falls down (as per standard operating procedure of any swimsuit I have ever owned that does not go up to my neck). Swimming in the pool is lovely; after all the hot errands and dustiness, the water feels like cool silk on my skin. After the game, I just float, enjoying the feeling of weightlessness and the sun reflecting on the water. At night, we host our first of probably many ad hoc and last minute dinner parties, with 11 people in attendance. Because it’s a new house, we don’t have enough dishes so the invitation reads: bring your own plates, knives, forks, tongs, serving utensils, wine glasses and/or cups and toilet paper. The party is lovely; we light the new coconut oil lamps and look out on the water at the large fishing boats. Tessa is a perfect hostess; she can see I’m less than up for the party and keeps everyone’s glasses and plates full. The party goes on till late and I crash into bed. The next day, Steve leaves at 4:30 a.m. for his flight back to Choiseul. Steve has been a pretty constant companion for almost a month and his help has been invaluable to me. He has chopped up food, organized people, entertained, fixed stuff, dealt with bugs and rats, and looked after the dog and cat. But I think Steve got something out of his experience in Honiara too…he even got a bit of romance (NOT FROM ME, PEOPLE!). When he leaves, I miss his presence, his passion for the environment and Anchorman (the film) and his absolutely dirty sense of humor. Fleur, our house mere (or keeper), comes early the next day. Okay, I want to say a bit about this arrangement because for those of you not living in developing countries, the concept of a house keeper or mere (as they say in the Solomons) may seem lazy or downright offensive. Fleur is much more than just a cleaner; she looks after me and Tessa. She gives us good tips on sourcing local goods, she teaches us about Melanesian food and helps me with my pidgin. She has a wonderful sense of humor and brightens our day. Granted, she isn’t the world’s best house mere; my clothes are covered in weird red brownish spots and the window slats are still dusty but having her there does help the house run smoothly. And it’s fairly inexpensive to have her there. Fleur comes twice a week to help with the running of the house. The other reason for having a house mere is that all the mod cons that one has living in a developed country aren’t here. Everything takes much longer; speed and efficiency isn’t the Solomon Islanders’ bag. Even simple tasks can take hours because we simply do not have the same access to time saving devices. So working five days a week (and obviously hosting dinner party after dinner party) and doing all the housework is downright a huge task. House meres are a part of expat life in Honiara and it is sort of expected that, as an expat, even a volunteer, that you have someone occasionally come and look after you. Fleur comes early and gives me a big kiss on the cheek. She speaks quickly to me in pidgin and despite my pidgin getting better; my head can’t quite get around her cheerful conversation. I need to sit down. I need to take a moment from the craziness. So I ask Tessa to look after Fleur for a few minutes while I sit on my deck and soak in my busy week. I look around at my turquoise house, at the coconut trees lazily swaying the breeze. I sip my espresso. I can see the local guys mowing the lawns of the high commissioners’ house; he is coming back soon. I see my next door neighbours, the lovely Stan and even lovelier wife Jean, sipping their cups of tea on the balcony of their chalet. The activity is slow and gentle in our little cul-de-sac. I feel peaceful and take a few minutes to reflect back on the week. I know it’s been crazy and social, but that is what I wanted. Still it’s nice to take a quiet moment to reflect and enjoy the sounds around me. “Sara, can we have Elsa and her friend from China come over for dinner tonight? Also, Martin and Jean want to have a neighbor dinner, so they need to come too…and Jocelyn wants to meet Elsa’s friend, can she come too…oh and we need to pick James up from the other house today…” Tessa yells from the downstairs kitchen.